Its finally happening, the biggest fight and sporting event of the century when undefeated Floyd Mayweather takes on Manny Pacquiao on saturday, 2 May 2015 in Las Vegas, USA for what is billed as the fight of the century. It has been 6 long years in making for this fight with countless hurdles one of which and probably the biggest hurdle was money involved in the fight. Mayweather wanting a bigger share of the purse was one of many reasons including blood and urine testing which halted the process of making this epic encounter. Now everything out of the way purse share confirmed, pacquiao agreeing for blood and urine test both HBO and Showtime combine coverage we can finally take a seat back and enjoy the build and of course the big fight this week. This fight is expected to generate easily more than $300 million in total revenue (might reach $400 million) from ticket sales plus Pay per view revenue and Floyd Mayweather has the purse 60/40 in his favour which means he is inline to make around $120 million guaranteed from this fight while Manny Pacquiao is expected to make around $80 million guaranteed but the actual earnings of both fighters are expected to reach $180 million and $120 million respectively after PPV sales share has been sorted. Pacquiao and Mayweather will get a $50 million check each the following morning of the fight as the first installment of the total purse. 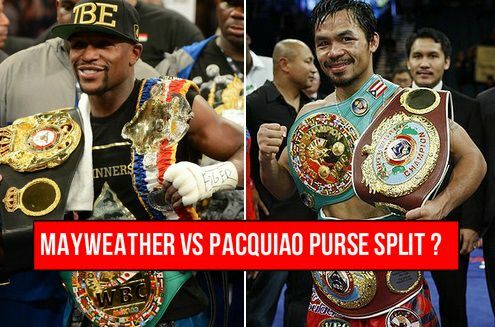 While rest of the purse will come in couple more installments after the PPV sales are counted. Here is how PPV revenue is expected to be shared between fighters, cable companies and HBO & Showtime. As the things stand there has been a massive interest in PPV sales which cost around $89.95 per sale and experts believe that this fight will do minimum of 3 million PPV buys and thats almost 500,000 more compared to previous record set by Mayweather-De La Hoya. With 3 million PPV sales the revenue from this stream will reach $270 million, Bob Arum and many expert believes that the PPV sales might reach 4 million and that will take the revenue from PPV sales to a massive $360 million. This is how the total revenue from the fight is expected, PPV plus other souces which include gate receipt, International broadcasting rights etc. Ticket for this fight are a gold commodity, hard to come by because MGM Grand has the capacity of only 16,800. But even with such small capacity the fight is expected to generate $72 million in gate receipts thanks to massively inflated ticket prices. Only 1000 tickets were made available to general public which were sold out in 60 seconds according to recent reports so the majority of the tickets are going to high rollers of MGM with credit line of over 250,000 with the casino while some tickets are available in black market which are priced at anywhere from 30,000 to 120,000 or even 200,000 for ring side tickets. So if Mayweather-Pacquiao hit 4 million ppv mark they will easily be taking home $180 million (Mayweather) and $120 million (Manny Pacquiao). Which will make them the top 2 highest paid athletes in 2015 which goes to show the magnitude of this fight.